Sun, 5/17- Imani's invite to BRIDAL SHOWCASE! Sun at, May 17 3pm-7pm Alhambra BALLROOM Bridal Expo in Harlem! SAVE the DATE! 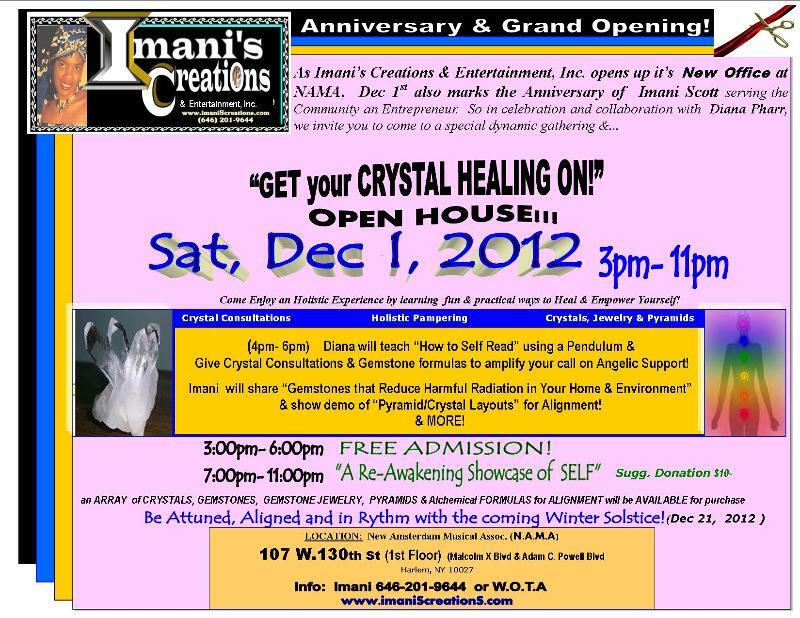 Imani SINGS & ICE Displays Jewels & Gems! More INFO on Imani's BRIDAL/WEDDING click to READ MORE! 12/12 Weekend- IC Booth at PE HOLIDAY POP-UP! on Fri 12/12 you're invited to see & shop Imani's Creations products & GIFTS at the Project Enterprise Holiday Pop-Up Store in a two day special shopping event featuring select Project Enterprise members selling gifts, jewelry, art, clothing & more. Fri Dec 12, 2014, 12 P.M.-8 P.M. & Sat, Dec 13, 2014- 11 A.M-6 P.M Location: 162 East 104th Street near Lexington Ave in East Harlem! FREE Admission & open to the Public! PLEASE CHECK BACK or call 646-201-9644 for more Shedule Updates! 1st Week in December! Imani's Creations celebrates 21 years of Entrepreneurship! Dec 2, 3 & 5 : I.CAnniv SALE Continues! Meet up Appointments available, also Phone, mail & online orders welcomed! Thurs, Dec 4 7pm-9pm Imani's creations will vend with DJ Card Creations at the Demcratic Club's Holiday Bazaar Phone & online orders also welcomed! IC will be vending as the Anniversary celebration continues along with King Simon at this Melanin Conference Event! NOV 29 thru Dec 8th, 2014! SAVE the DATES & STAY TUNED for MORE UPDATES! POP-UP SHOWCASE & "HEALING with GOOD VIBES"Celebrations! More Locations, Times & Updates will soon be posted! & then at 7:00pm Imani's Creation Anniversary Celebration Continues! FREE Admission! IC PRESS RELEASE- 12/7 Anniversary Event! Event Date: Sat, Dec 7, 2013! "GET your Crystal HEALING ON!" Please also Pass it on! WEAR YOUR Imani's Creations Jewelry or Accessories during event & Register to GET a Special GIFT &/or WIN a PRIZE!!! EXTRA SPECIAL NOTE: To those on my LIST getting this Email! If you already have a Quartz Crystal from Imani, then bring it for a special Re- Charge & download updates during the the Re-Awakening Showcase!